“… I knew this labels customer and this would be an expensive technique to balance it I used one of the convertibles silhouettes, a skirt that could be worn as a strapless dress, but this was not stretch and I wanted the appearance of fit and flare. The chiffon also needed to be lined so we went with a self-lining in silk, and added a drawstring at the neckline that fitted the bodice around the bust! 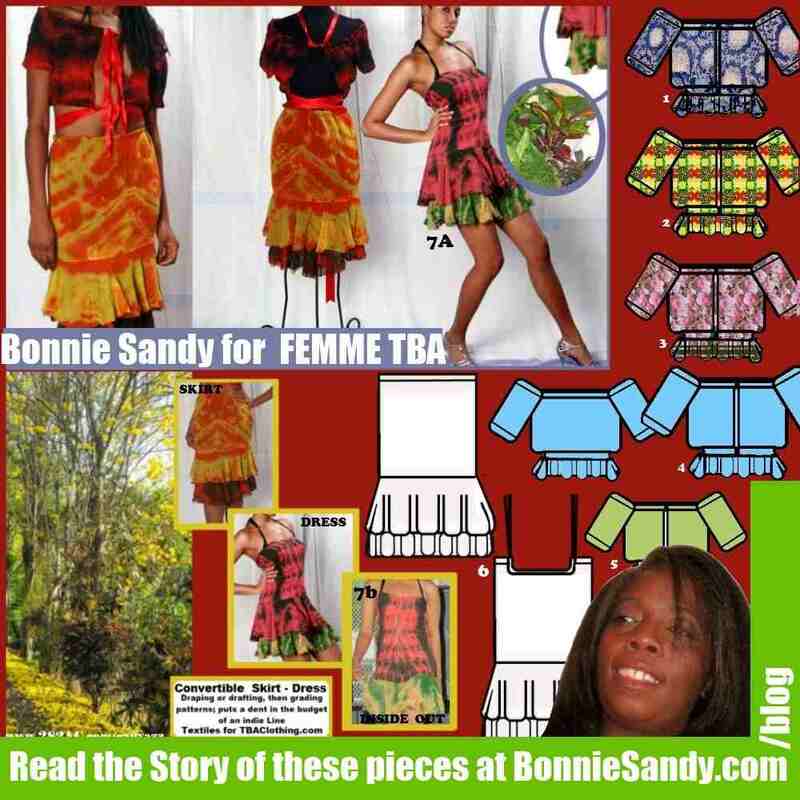 Now we had a skirt that can be worn as a dress with a front halter tie, a back bow ties or a one shoulder tie… later one of the models threw it on inside out so we had another option to sell this item. I remember the first time a customer said to me she was fascinated by the story of clothing and loved seeing the making process. Seldom as a designer do you think stories are important. There are several stories I can tell about this piece. It is a tie dyed interpretation I did for William Fleet of Femme TBA.. He wanted a two layer flounce skirt, and came to me as a technical designer specifically because I did a “unique tie dye process”. He wanted red green and gold in celebration of Pan Africanism. 100% silk chiffon, for this, was a natural choice for the desired flirty effect, I decided to go with a hot water process which meant pre-shrinking the fabrics red green gold and black, can be a very strong combination, rather than mix them I opted for layers of individual colors! As I worked I thought of the Poui and the Croton in my Native Trinidad, foliage from which I drew inspiration. After pre-shrinking the fabric, it was time to think the design through, I knew this labels customer and this would be an expensive technique to balance it I used one of the convertibles silhouettes, a skirt that could be worn as a strapless dress, but this was not stretch and I wanted the appearance of fit and flare. The chiffon also needed to be lined so we went with a self-lining in silk, and added a drawstring at the neckline that fitted the bodice around the bust! Now we had a skirt that can be worn as a dress with a front halter tie, a back bow ties or a one shoulder tie… later one of the models threw it on inside out so we had another option. We did two for Wills show and in one version that was meant to be worn as a dress I decided To accentuate the curve doing slightly vertical lines that simulated a woman’s curves… The effect was successful creating an ultra-feminine product for a younger client! Then came the question… how can we repeat this on a budget, which sent me on a journey that led to digital printing and a quest that would lead to Canvazz. then agian designer need a platform to sell… if you are interested in this piece feel free to use the Live chat or contact form. Over thanksgiving I tried showing my Aunts some of the TT designers product. What a disappointment she saw a dress she liked I cannot find purchase info or the designers site! ! I was also so disappointed! Then this week in NY, I wanted to share the designers’ items with my list especially over this weekend. There were a number of problems. They did not have information at hand, so I could craft stories of their products to share with my list. They did not have sales and marketing collateral in a convenient place for me to share. Few wanted to have others share they wanted CONTROL.. one designer I spoke to literally said that it would ‘bleed into his profits”… which means he’s incorrectly pricing his products or just plain greedy. Even if they did, few had any means of tracking or acknowledging those who shared.. .
Social commerce is her but few understand it, why are they on Facebook … I’m not sure. Even as the way we sell changes we need to think the process through! I explore the how of technology for creative. I find that very few are cognizant of what they are doing or why. The very concept of social commerce is about getting other to sell for you by having them share your items. at the least you should say thank you, but in today’s market with the tools that exist, one can give an affiliate reward. An affiliate reward is an incentive to those who support you! Often once an item is posted you loose control of its link back to you… add a signature. As for having images on other sites… once that site links to you why not encourage that! Leave some of your images for others to share. I do not want share images I see blasted all over Social Media … so keep a few offline. I also am not sending my customer base to a third party site, so I use my own… or designers get you own site. unless Etsy is paying your marketing send me your link. Tools for “Storytelling” as sale..